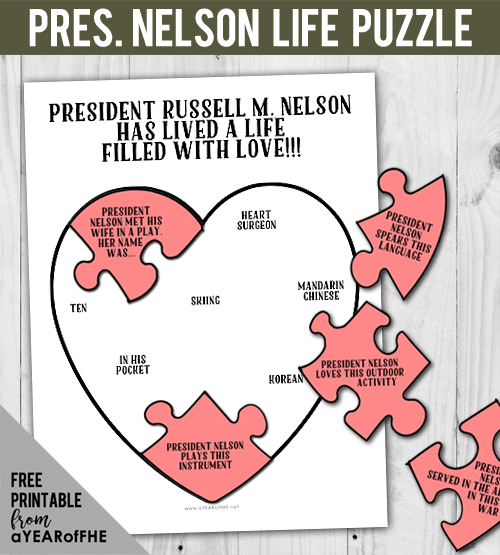 What You'll Need: scriptures, printed life pictures poster, puzzle activity page, quote fill-in page, pen or pencil. NOTE: You may choose to start this lesson by reviewing how a new LDS Latter-day Prophet is called using the free download found here. Heavenly Father calls Latter-day Prophets to lead his church and share the gospel of Jesus Christ with the world. 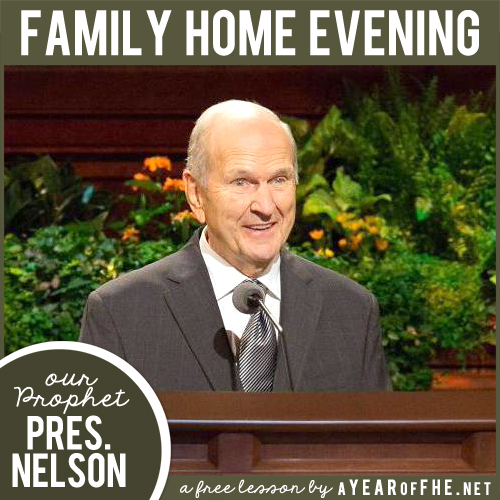 Today we are going to learn about our current Prophet, President Russell M. Nelson. President Nelson was born in Salt Lake City, Utah. As a boy, Russell’s parents taught him that family should always come first. In the evenings he would play games, read, or sing with his parents and siblings. He remembers that during school, he would go home for lunch, and at least once a week his mother tried to feed him beef liver. Russell did not like the taste or the texture of liver. He would wait until his mother looked away, then stuff the liver in his pocket. On his walk back to school, he would throw it away in an empty lot. “This maneuver was a little hard on pockets, but it was, nevertheless, very successful,” he says. Russell played football in high school, but often sat on the bench during games, because he did not want to damage his hands. He was very protective over his hands and feared someone might step on them with their cleats. His coach, no doubt annoyed, kept Russell on the bench. Forty years later, Russell performed surgery on his coach with those hands. President Nelson is a great singer and plays piano and the organ very well. He spent a lot of time in choirs and musicals growing up. When Russell was in college he was asked to be in a school play. When he came to practice, Russell heard the most beautiful singing. It was the voice of the lead soprano: Dantzel White. He said, “She was the most beautiful girl I had ever seen, and I sensed that she was the one whom I would marry”. Russell and Dantzel were married 3 years later and had a large family of ten kids; nine daughters and one son. When he was 22 years old, he finished medical school with high honors. He then worked hard to become an expert heart surgeon. Once, in a meeting, the Prophet at the time, Spencer W. Kimball, spoke about missionary work in many parts of the world. He asked everyone at that meeting to learn Mandarin Chinese.President Nelson followed that council. Mandarin is a very hard language to learn, but Russell M. Nelson listened to the Prophet and followed his council. His desire to speak to people in their own languages also prompted him to learn French, Russian and Spanish. Later, President Nelson, who was not an apostle at the time, performed open-heart surgery on President Kimball and said this about the experience: "I shall never forget the feeling I had as his heart resumed beating, leaping with power and vigor. At that very moment, the Spirit made known to me that this special patient would live to become the prophet of God on earth." President Nelson LOVES being in the outdoors. Skiing is one of President Nelson's "greatest loves". He also has fond memories of summer vacations with his family and spending one day a year horseback riding with his children. Later in their life Russell's wife, Dantzel Nelson, passed away. President Nelson married Wendy L. Watson, an author and Brigham Young University professor, in April 2006. Bear your testimony about the new Prophet. 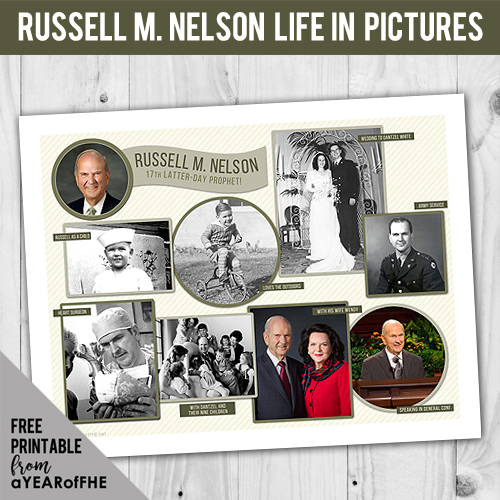 Share with your family that each of them can receive personal revelation that Russell M. Nelson is God's chosen Prophet on the earth. Thank you.... this exactly what I was looking for! Your site and ideas are just amazing!! Thank you so much for being so willing to share with us all!! Love your site. Thanks for putting this together! Thank you so much for doing this and sharing it so freely! This is just the perfect lesson to use with my Activity Day girls! Hi there! This is Heatherly, Sean's wife and your cousin, this is perfect! So glad to have stumbled across this FHE for tonight! Thank you for sharing. Doing this tonight - thanks Emilie! This is so great! Thank you! Thank you! Thank you! Planning FHE is something I dread every week and it always ends up being something very simple and thrown together. This is saving my bacon. Thank you So much Emilie! I was looking for this exact thing for tonight! We used this lesson for family night tonight. Thank you so much! We did this for FHE tonight, and it was great! Thank you! EXACTLY what I was looking for...THANKS FOR SHARING! Wowza! Just found ya, girl! What an incredible thing you are sharing with the world. Thank you so much! Thank you for the time and effort you have put in that has made sharing the gospel with our children so much easier for us. I have said a prayer that you will receive the blessing you need in your life since you have helped so many others. 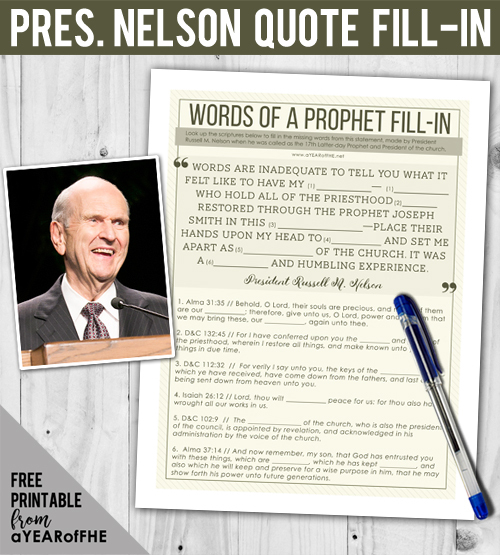 This Lesson was a great way to help our kids know President Nelson a little better; especially right after he was called. Thank you for putting this lesson together!! Wow. Awesome. Thanks SO much for sharing. It's a great blessing to so many of us. What a talent you have! And I SO appreciate your sharing it.